ADVECTION FOG.Advection fog is the name given to fog produced by air in motion or to fog formed in one place and transported to another. This type of fog is formed when warmer air is transported over colder land or water surfaces. 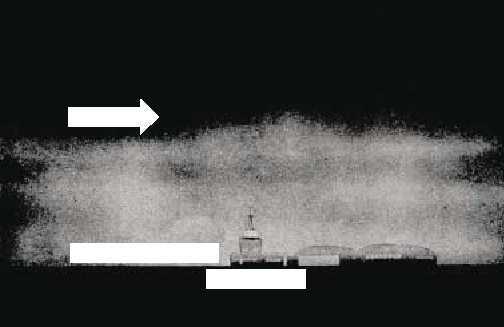 Cooling from below takes place and gradually builds up a fog layer. The cooling rate depends on the wind speed and the difference between the air temperature and the temperature of the surface over which the air travels. Advection fog can form only in regions where marked temperature contrasts exist within a short distance of each other, and only when the wind blows from the warm region toward the cold region. (See fig. 5-3.) It is easy to locate areas of temperature contrast on the weather map, as they are usually found along coastlines or between snow-covered and bare ground. Sea Fog.Sea fog is always of the advection type and occurs when the wind brings moist, warm air over a colder ocean current. The greater the difference between the air temperature and the ocean temperature, the deeper and denser the fog. Sea fog may occur during either the day or night. Some wind is necessary, not only to provide some vertical mixing, but also to move the air to the place where it is cooled. Most advection fogs are found at speeds between 4 and 13 knots. Sea fogs have been maintained with wind speed as high as 26 knots. They persist at such speeds because of the lesser frictional effect over a water surface. Winds of equal speed produce less turbulence over water than over land. Sea fogs, which tend to persist for long periods of time, are quite deep and dense. Since the temperature of the ocean surface changes very little during the day, it is not surprising to hear of sea fogs lasting for weeks. A good example of sea fog is that found off the coast of Newfoundland. Land Advection Fog.Land advection fog is found near large bodies of water; that is, along seacoasts and large lakes. Onshore breezes bring maritime air over a land surface, which has cooled by radiation at night. (See fig. 5-4.) Also, fogs may form over the ocean and be blown over the land during either the day or the night. Another situation favorable to fog formation is one in which air flows from warm, bare ground to snow-covered ground nearby. Land advection fog cannot exist with as high wind speed as the sea type because of the greater turbulence. It dissipates in much the same fashion as radiation fog. However, since it is usually deeper, it requires a longer time to disperse. Steam Fog.Steam fog occurs within air masses; but, unlike other air-mass fogs, which are formed by the cooling of the air temperature to the dew point, steam fog is caused by saturation of the air through evaporation of water. It occurs when cold air moves 5-8 AG5f0503 WARM AIR COOLING BY CONTACT COLD GROUND Figure 5-3.Advection fog.